So for years, this tiny lakeside town has been gnawing at me. I needed to see what all this fuss was about! Recently we spent three nights here, finally understanding why I’ve spent years listening to Argentine’s rave about this tiny corner of Patagonia. This is Argentina’s lake district and is an outdoor enthusiast’s dream. Are you planning a visit to SMdlA? This post is a complete guide filled with everything you need to know from where to stay, what to eat and things to do in San Martin de los Andes, Argentina. There are a number of hotels downtown covering all price ranges and budgets. But when I saw pictures of the Arrayan Hostería de Montaña , I was sold. This small property is less than 5 kilometers from the city center but feels isolated in the mountains. The four rooms all look towards Lago Lacar. We would sit on our private deck each evening to watch the sunset over the lake. The breakfast buffet is served in the same building as the rooms but in a sort of tower/tree house. It’s built higher up, with an even better view of the surrounding area. The fireplace in the center of the room made it extra cozy while we ate. The breakfast was very good, with eggs, fruit and yogurt served alongside the Argentine staples of pastries, toast, and jam. Check availability here . This hotel and historic tea house were founded by a young Englishwoman, Renée Dickinson, in 1930. She fell in love with the region while traveling with her brother. She acquired the rights to develop the land one year before the area became a national park, on the promise of developing it for tourism. She named her tea house after her nickname, Arrayán, due to her own similarities with the tree native to the area. She was also tall, white, and her red hair echoed the red bark of the Arrayán trees. We had an excellent experience at the Arrayan Hostería de Montaña. I'd recommend staying here if you have a car, as taxis to and from town (while possible!) may be a hassle. Check availability here . To have the best experience in San Martin de los Andes, I recommend you rent a car. While if it's out of your budget you can get around without your own car. There are taxi companies and even ferries to Hua-Hum and Quila Quina. If you're outdoorsy and have a lot of confidence in your lower body strength, you can even bike part of the 7 lakes route. But, big but, you won't have even a fraction of the freedom to see everything you want without your own car. A lot of places aren't accesible otherwise and you'll miss some of my favorite spots (like Playa Yuco!). If you're curious about renting a car in San Martin de los Andes, check rates here. Being in the heart of Argentina’s lake region, it’s natural that most San Martin de los Andes things to do revolve around the lakes. The town lies on the shore of Lácar Lake and the Lanín National Park. Most activities are on or near Lago Lácar within the park. Playa Yuco was my absolute favorite place we visited in the area. From the parking lot, it’s a short walk down a dirt path to get to the beach. It’s in a bay that feels like a secret, hidden away from the rest of the lake. We spent a while lounging, reading, and picnicking on the make-shift driftwood table and benches some unknown genius set up. Right before you reach the beach, a path forks off to the right. This trail winds along the shoreline. You can reach the large boulders and rocks that jet out over the water from here. The views are great and change from every angle. If it’s summer, you can brave the cold water and go for a dip. But beware, the water is cold and deep. Continuing west from Playa Yuco, find the Lago Nonthue exit. We missed it but heard it’s beautiful (so many regrets)! We did, however, stop at Hua Hum. There is a restaurant, beach, and pier here. If you’re counting on eating here, check the hours before going. While we were there they were only open from 4-6 pm (conveniently when a tour was scheduled to dock at the pier). The beach was beautiful and very different than the scenery at Playa Yuco. It was grassier and easier to access. If disabilities or an injury makes descending the trail to Playa Yuco impossible, you’ll be more comfortable here. Hua Hum marks the northwestern edge of the route, but we kept driving to loop around to the southern portion of the lake to see the Chachín Waterfall. There’s a short thirty minute hike to a viewpoint of the waterfall. The waterfall was beautiful, but let’s be honest, all of these waterfalls in the mountains look the same after a while. The beauty of walking through the forest was my favorite part of the hike. It’s an easy hike, and more of a walk through the forest. The incline on the ascent left me out of the breath a couple times but this is a family friendly, easy trek! There’s a picnic site at the base of the Cascada Chachín trailhead with clean bathrooms and a small cafe selling snacks, drinks and hot torta frita (fried dough, sometimes with ham and cheese). ITINERARY TIP | You can easily spend an entire day driving the above route and it's actually how we spent our first day in San Martin de los Andes. Pack a picnic and visit Playa Yuco, Lago Nonthue, Hua Hum, and Cascada Cahchin. This can all fit comfortably into one day without being rushed. In San Martin de los Andes you are sitting at the northern end of one of the most beautiful routes in the country. Argentina’s 7 Lakes Route begins here and ends in Villa la Angostura (just north of Bariloche). This stretch of the iconic Ruta 40 highway weaves through the lakes, offering beautiful vistas along the way. Most lakes offer only a panoramic viewpoint but some have great beaches, campsites and restaurants to fill your day. Read my complete guide here to plan your seven lakes drive. Quila Quina is on the southern shore of Lácar Lake. Access to it is down a 14 kilometer dirt road off the Ruta 40, just outside of San Martin de los Andes at the beginning of the 7 Lakes Route. Quila Quina Village is home to the indigenous Mapuche Curruhuinca people. The main road leads to the most popular beach, a small handicrafts market and restaurant with a deck that overlooks the lake. In summer, it can get crowded here with locals and tourists swimming and sunbathing. I tried to have lunch at the restaurant to take advantage of their deck’s view. But due to the yellow jacket wasps that swarmed my plate (they even stole chunks of meat! ), I had to grab my food and stash it in the car! While the area around the pier and restaurant is nice, if you stay on this road and drive to the left you’ll find a huge, quieter beach. I far preferred it, and the hoards that took the ferry from town to Quila Quina congregated by the restaurant. Avoid those crowds by going a little further down the shore. Fishing season opens at the beginning of November each year. You can go fly fishing in a number of the rivers and lakes for salmon and trout. A permit is required to fish here, so don’t go without one. Neuquen is the first province to switch to an online process for acquiring permits, get yours here. Hiking in San Martin de los Andes remains on my to-do list. We were in desperate need of relaxation when we went, so we decided to leave the many tempting trails for future trips. The National Park has worked hard to put together a list of the best 25 trails in the park. They cover all difficulties, varied landscapes, and even include bike trails. I tried to choose a few to highlight, but I actually want to do them all (not practical). Read the full list on the official park website here (sorry, only in Spanish). They include the difficulty, expected time and what to pack. I am a self-confessed chocoholic. If you’re like me, you’ll love this region of Argentina. Bariloche, Villa la Angostura and San Martin de los Andes are all home to some excellent chocolate! These towns were colonized heavily by Europeans and they brought their A-Game with them. 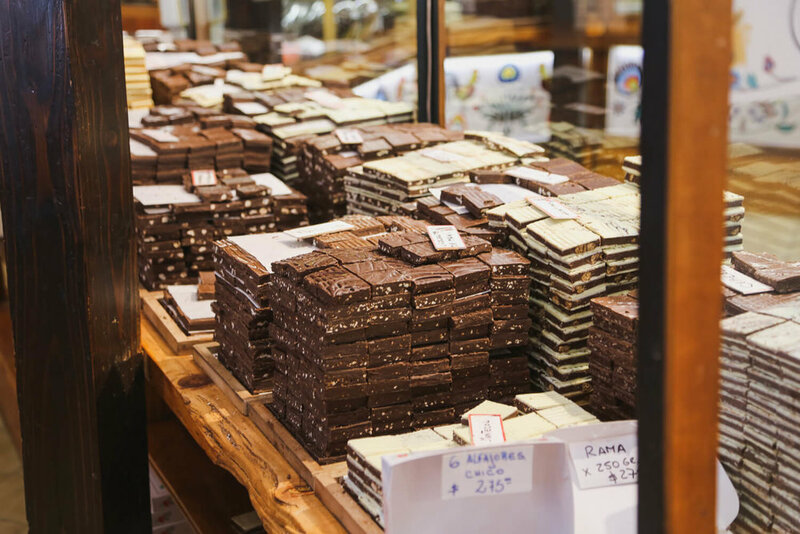 Along with tea houses and fondue restaurants, you’ll find the country’s best chocolate. Many of the big-wigs in the Patagonia chocolate industry hail from Bariloche and have even become local chains (with locations as far as Buenos Aires). However, there are two shops that are original to San Martin de los Andes. Shop local and buy from Mamusia and La Vieja Aldea to try something you won’t find anywhere else. We had two excellent dinners out! A third, we ate in our room, exhausted from our long drive. ULISES | We enjoyed a nice night out at Ulises. Their specialty is their fresh pasta, with raviolis filled with local delicacies like deer, lamb, and trout. Martin ordered the deer raviolis. I had pumpkin ravioli topped with almond, parmesan, and olive oil. 10 out of 10, would recommend! In place of a wine menu, they brought me to a side room to pick my wine. They had a huge variety, with something for every budget. I picked a local Patagonia wine, to match the Patagonia pasta. NONINO EMPANADAS | After we drove the 7 lakes route, we picked up half a dozen empanadas at Nonino to take back to the hotel. They have all the classic flavors (I loved the carne salteña!) as well as special fillings that you won't find in Buenos Aires like lamb, trout, deer, and seafood.